Democrat Debbie Stabenow successfully defended her U.S. Senate seat Tuesday, defeating Republican challenger John James. But Democrats nationally were projected to lose several seats in the Senate, falling further into the minority and limited their ability to block the chamber’s Republicans. With 59 percent of precincts reporting as of 11:45 p.m., Stabenow led 52.3 percent to 45.7 percent, according to election data published by The New York Times. James, a businessman and former combat veteran, ran as an ardent supporter of President Donald Trump. 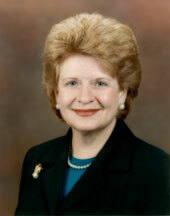 Stabenow has represented Michigan in the U.S. Senate since 2001. She is a ranking member of the Senate Agriculture Committee and has made agriculture and the environment top priorities for her agenda. She launched her political career on the Ingham County Board of Commissioners. She served in the state House from 1979-1990 and was the first woman from Michigan elected to the U.S. Senate. Michigan’s other Senator, Democrat Gary Peters, has represented Michigan since 2015. He is up for re-election in 2020. The U.S. Senate was projected to stay within Republican control in this election. Before the election, Republicans had an 82 percent chance to retain control of the chamber, according to Five Thirty Eight‘s Senate forecast. According to USA Today, Democrats had to defend 26 of the 35 seats on the ballot. Voters in 10 of those states with Democratic senators voted for Trump in the presidential election election. Currently, there are 23 women serving in the U.S. Senate with 52 overall since 1922. Evan Jones and Kara Keating contributed to this report.